We provide qualitative and cost effective care to your loved ones. We offer comprehensive care packages that meet today's healthcare specifications. We are industry leaders in coordinated care, supporting our goals with cutting edge technology while ensuring a strong bond with consumers, their families and our team of higly skilled and committed individuals. Royal Home Care is a home health agency that provides outpatient healthcare services to patients ranging from infants to the elderly. We pride ourselves in giving quality and holistic care. We provide qualitative and cost effective care to your loved ones and offer comprehensive care packages that meet today's healthcare specifications. We are industry leaders in coordinated care, supporting our goals with cutting edge technology while ensuring a strong bond with consumers, their families and our team of highly skilled and committed employees.We are committed to creating an agency where holistic caring is the guiding theme; a place where excellence in caring would not be compromised by financial advantages, an agency where patients and loved ones can be sure that caring for our clients is the most important job we have. Royal Home Care adheres strictly to state regulated practices, never losing sight of the dignity and confidentiality of our consumers. We are licensed by the state of Texas and certified by the Center For Medicare & Medicaid Services. We are located in the southwest side of Houston, TX. We have been in existence for about a decade. We started with 5 employees covering Harris County. We now have over 300 employees covering all of Texas. Royal Home Care is an agency with moral and ethical values, dedicated to providing holistic and quality health care. We are committed to assessing and creating health care solutions that meet the needs of all our clients in our diverse communities. To be sensitive to the concerns of our patients and staff. To be responsive to the needs of our patients and their loved ones. To do all we can to improve the clinical outcomes of our patients. To deliver the best care possible with our highly skilled professionals. To prevent health problems while providing our clients the best chance to regain their health and reclaim their lives. 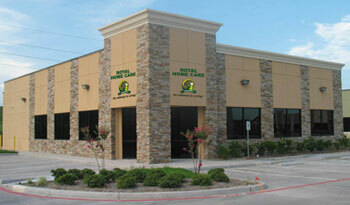 At Royal Home Care, we treat you as royalty.